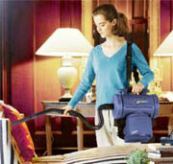 Pro-Team's residential hip-style vacuum, available for use with the Pro-Team Turbo Nozzle for plush or high pile carpeting. The TailVac is compact and lightweight, only 8 lbs., for quick and easy vacuuming around and under furniture, up staircases, into corners, completely under beds and inside vehicles: anyplace you need to vacuum! It is available with a variety of useful tools making this vacuum versatile for carpeting, hard floors, furniture, vents and more. 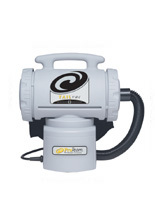 TailVac® carries an unmatched 3/3/3/Life warranty - 3 year parts, labor and motor and life on the molded body parts. Option 1: wear the vacuum around your waist with or without the shoulder strap. Option 2: fold the waist belt into it's envelope style packet and sling the vac over your shoulder by the strap. 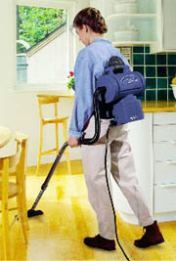 Option 3: with the waist belt folded carry the vacuum by the handle.